1996 The idea of purchase of South Strome Forest was born, after reading about Laggan forest in the papers. Steering group formed. First meeting with Forestry Commission. FC inform us that it is not for sale. Lots of ideas – café at the viewpoint, field centre at Strome, changes in management to improve amenity and forest environment. 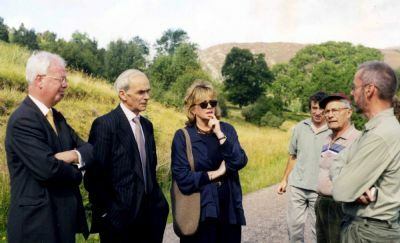 1997 Talks with Forestry Commission about partnership agreements. Fernaig Estate goes on the market. 1998 Fernaig Community Trust set up. Bid to purchase Fernaig with HIE backing fails. John Denham buys it, but offers us the fields in Srath Ascaig. 1999 Negotiations to buy fields start. After visit to Cairnhead in Dumfriesshire, their “Concordat” is favoured as model for agreement with FC. A project to work with Achmore dairy is looked into, but founders because of funding issues and lack of time to work the project up. 2000 Ellanne Fraser employed as part time ‘resource worker’ for 6 months, funded by Community Land Unit. 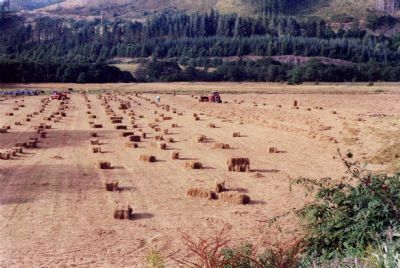 110 acres of agricultural land purchased, funded by HIE and sale of 2 house sites to Highland Small Communities Housing Trust. Concordat signed with FC. Talks with FC about purchasing old forest office. 2001 New fencing, drainage, and access road built. Holdings and allotments leased. Colin Parsons starts as ‘Development Officer’, part time for 3 years. Work on new Forest Design Plan starts. 2002 Trees planted on Trust land under Woodland Grant Scheme. New footpaths opened in Strome Wood, funded by SNH, SALE, HC, and the Trust. Iron Age Hut built in Strome Wood by Youth Club. Old Forest office purchased and renovated. Agreement signed to allow community use of fank, field & shed. 2003 Village hall garden created. Community Woodland Association launched, with Colin Parsons a director. Local rights of way researched and registered. 2004 New Design Plan completed. Café feasibility completed. Project shelved due to funding, road access and displacement issues. 2005 Second phase of footpaths planned and funded but fails due to paperwork problems. Major wind damage in South Strome Forest. Paths damaged. National Forest Land Scheme launched, bringing forest purchase back on the agenda. Chainsaw courses organized for Trust members. Meeting of west coast community woodland representatives at South Strome. 2007 Native Woodland Restoration & Continuous Cover Plan written for the Forest. 2009 Feasibility Study into Forest land purchase. 2014/15 FCS repaired the drystane dyke by the road and field in Achmore adding to their skills level! Liaison with FCS continued in maintenance of Strome Woods. Work also began on repairs to the Old Forestry office in Achmore, now owned by the Trust.